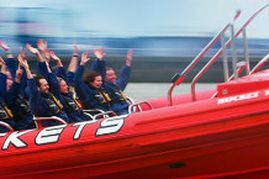 New for 2017, Break The Barrier has been revamped to ensure its reputation as the number one ‘all speed’ London experience. You’ll feel like something out of a James Bond movie as you take to the water in a cutting edge Rocket, speeding along the Thames accompanied by a soundtrack of tunes from the 1960’s through to modern day tracks. 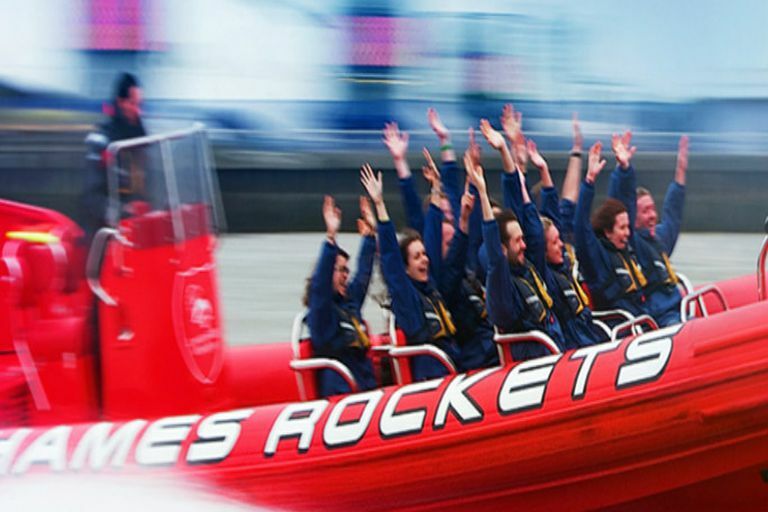 The sights of Tower Bridge, the docklands, the maritime Greenwich, the O2 arena and the Thames Barrier will leave you awestruck as they are viewed from a new perspective at intense speeds. Hold on tight as this forty minute journey twists and turns and rocks and rolls through the city, sing along to the sounds as you bounce across the wake and enjoy the comedy of your tour guide, who is on hand with London knowledge and banter to keep you laughing for the whole journey. The Rocket will be pushed to the limit - it’s fast, it’s furious, it’s a world first. It’s ready - are you? Please note: THIS IS NOT A CONFIRMATION. We have acknowledged your request and you will be sent a separate ticket by email with your confirmed time slot and reservation number. Please ensure that you take this reservation number and ticket with you to the venue, as admittance will only be permitted with this ticket. Please take your voucher/confirmation to the ticket office along with photo ID for entrance to The Ultimate London Adventure. On all of our Thames river experiences we demonstrate a clear and unswerving commitment to safety – your safety and comfort are paramount. We are the largest speedboat operator of RIB voyages in the UK and being the original provider of such experiences have set the industry standard others are now expected to follow. Should you require copies of our Insurance, we will be happy to e-mail this to you in advance of your booking. If you require risk assessments or Domestic Safety Management Codes then these are available to view, upon written request. We work closely with the Maritime Accident Investigation Bureau to bring in new safety codes, modes of operation and analyse how the industry can be safely improved to achieve a balance between commercial considerations and reducing risk as low as reasonably practical. Unfortunately this experience is not suitable for expectant mothers at any stage during their pregnancy. Our experiences are also not recommended for anybody with a past or current back, neck or heart condition due to the unpredictable nature of the Thames. Please understand we are not medical experts and cannot offer guidance on individual cases, our automatic advice would be if you have concerns please do not participate for your own comfort and welfare. Children are 14 years and under. Children must be accompanied by an adult.